Anyone used to seeing eucalyptus trees stretch to the skies in parks or woodlands may be surprised to see eucalyptus growing indoors. 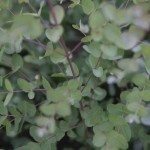 Can eucalyptus be grown indoors? Yes, it can. Potted eucalyptus trees make a pretty and fragrant potted plant on your patio or inside your house. Outside, eucalyptus trees (Eucalyptus spp.) grow to 60 feet tall and those half-moon-shaped leaves flutter in the breeze. They are tall evergreen trees with aromatic leaves. But the tree grows well indoors too. Potted eucalyptus trees can be grown as container perennials until they get so big that they must be planted in the backyard or donated to a park. Eucalyptus houseplants grow so fast that they can be grown as annuals. Grown from seed planted in the spring, the trees will rise to 8 feet high in one season. If you are interested in growing eucalyptus indoors, you need to learn how to grow eucalyptus in a container. The rules are few, but important. If you use a conventional, round pot for your eucalyptus houseplants, the roots are very likely to start circling the inside of the pot. In time, they will be so tightly wound that you will not be able to transplant the tree. Instead, plant your tree in a large, cone-shaped Air-pot. That way, you can transplant it outdoors or donate it to the park if you like. Plant it in well-drained, fertile soil and give it ample water on a regular basis. Once a week, add liquid food to your plant water. Do this from early spring through the end of summer to feed your eucalyptus houseplant. Use a low nitrogen fertilizer. Eucalyptus, potted or not, require full sun to thrive. Place your eucalyptus houseplants on the patio in a sunny, sheltered location where it is easy for you to water it. You can also dig a hole and place the container in it, sunk to the pot lip, all summer long. In mild climates, leave the plant outside permanently. In a cold climate, you must bring the plant indoors before the first frost of autumn. You can cut bushy plants to the ground before overwintering and store in a cool basement or garage.